Samsung devices have been popping up a lot in leaks and rumors recently. The Samsung Galaxy Note 9 has been the subject of multiple reports. We’ve seen it in four different colors, heard about the new Bluetooth S Pen features, and spotted a wireless charger accessory. The wireless charger was interesting because it can charge a watch and phone at the same time. It just so happens that the Samsung Galaxy Watch has been in the news a lot as well. 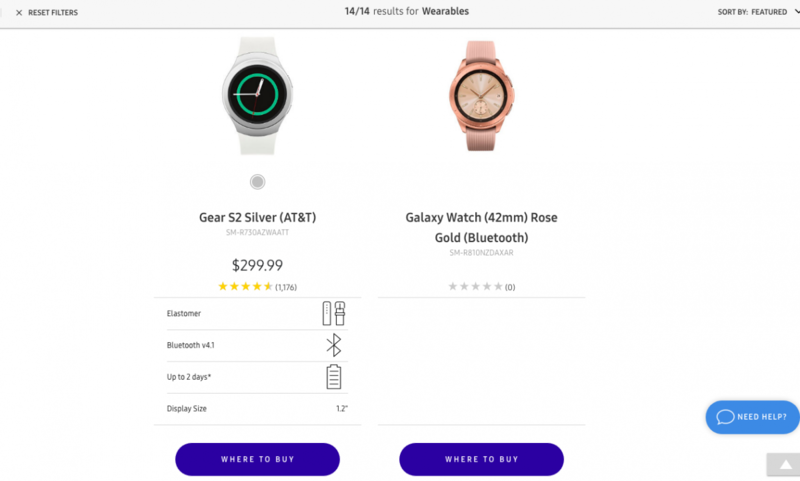 The Samsung Galaxy Watch already seemed inevitable, but now Samsung has jumped the gun and posted it on their website. The “Galaxy Watch (42mm) Rose Gold” edition appeared on Samsung’s own website. If that’s not enough proof, the model number matches up with a report from March. There is no price listed on the website yet. We’ve been following the Samsung Galaxy Watch since it was expected to be called the “Samsung Gear S4.” That changed when a report suggested it would be called the “Galaxy Watch” and run Wear OS. Unfortunately, half of that report turned out to be false. The Galaxy Watch will indeed run Tizen OS, just like previous Gear watches. Samsung changed the naming scheme to match it up with the Galaxy phone series. Last we heard, the Samsung Galaxy Watch is expected to announced alongside the Galaxy Note 9 at the August 9th event. It should be released on August 24th, if the rumors are correct. In terms of specs, we don’t know a lot about this smartwatch. We expect it will be available in more colors and possibly a smaller size. Are you excited about the Galaxy Watch? Did the Wear OS news dampen your expectations?